No, Mr. President, an executive order can't change the Constitution. Here's why. ANALYSIS: Harry Truman and Bill Clinton found out about the limitations of presidential power in the courts. Trump will, too. President Donald Trump attacked House Speaker Paul Ryan, R-Wis., on Wednesday for his opposition to a presidential executive order ending birthright citizenship for the children of parents not legally in the United States. "Paul Ryan should be focusing on holding the Majority rather than giving his opinions on Birthright Citizenship, something he knows nothing about!" Trump tweeted. Trump doesn't seem to know a whole lot more about executive orders and how they relate to constitutional rights. First, it appears likely that birthright citizenship is a constitutional right. There are opponents who claim that it is not, or at least that it's an open question. Still, it's hard to argue with what appears to be clear language of the 14th Amendment Citizenship Clause, the history of reliance on this "right" and Supreme Court cases which appear to endorse "jus soli" — constitutionally granted citizenship by virtue of birth on American soil. If birthright citizenship for children of parents not legally on American soil is enshrined in the 14th Amendment, it cannot be extricated by means of an executive order. Article II, Section I of the Constitution provides that "(t)he executive power shall be vested in a President of the United States of America." And that's mostly it, as far as the Constitution goes. That hazy language establishes the president as the head of the executive branch, and renders him the boss of the heads of government agencies. It’s also the source of power for the executive order or "EO." While nebulous at times, there have been generally two kinds of EOs since President George Washington's time: "documents with written instructions … to executive branch officials" and "written statements that communicate a presidential decision…"
The president's power includes "general administrative control of those executing the laws," within the Executive Branch. Seeing that the laws are faithfully executed vests in the president the power to provide guidance and supervision to his subordinates. There are recognized limits, however: "The President's power (under Article II, § 3) to see that the laws are faithfully executed refutes the idea that he is to be a lawmaker." The "executive order" must ultimately be subordinate to statutes enacted by Congress. The federal judiciary is also empowered to review the constitutionality of EOs. Indeed, it is the recognized duty of federal courts to preserve the Constitution's safeguards. In the past, the courts have invalidated executive orders that exceeded presidential power. In 1952, for instance, the Supreme Court held that President Harry Truman's executive order that authorized his secretary of commerce to take over the country's steel mills was unconstitutional because the president acted without constitutional or statutory authority. And in 1996, the D.C. Court of Appeals concluded that an EO issued by President Bill Clinton was unlawful. Clinton's EO prevented employers performing under federal contracts from hiring strike breakers. The D.C. Circuit concluded this EO interfered with employers' right to hire their chosen workers. If the president cannot legislate by EO, and if he cannot overturn congressional legislation by EO, then it follows that he surely cannot overturn an established constitutional right, even if he really, really disagrees that such a right exists. Even if the White House has a good faith belief that birthright citizenship is based on the public's, and the Supreme Court's, misinterpretation of the constitution, it's pretty clear the rest of the country has operated for hundreds of years in reliance on birthright citizenship. The right predates the United States itself, as it derives from the English common law. 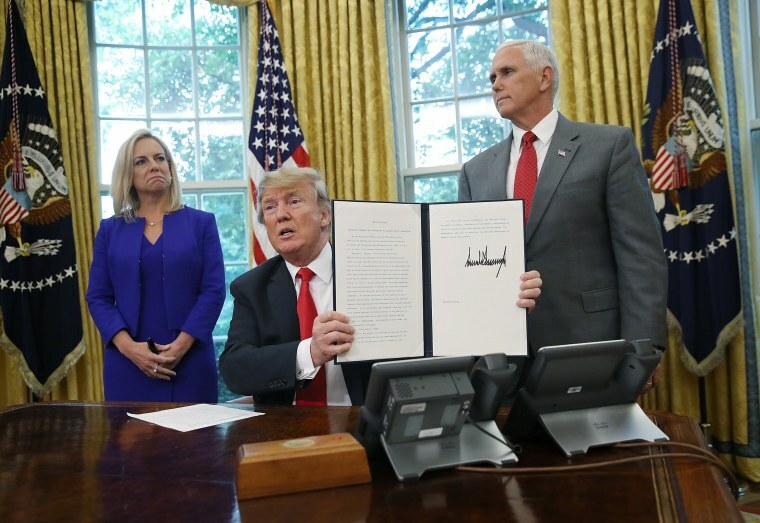 At a minimum, an EO removing birthright citizenship would require demonstrating to the reviewing court (in the case that would be filed 30 seconds after the EO was issued) that the Citizenship Clause of the Constitution has been misunderstood for centuries, and is therefore inferior to an EO. And then the court would have to consider whether executive orders — which are below both federal statutes and the constitution on the legal hierarchy — could deign to remove a right considered constitutional for so long. It's just not likely, though there are opponents of birthright citizenship who say it's possible. Trump is convinced that he has the power to remove birthright citizenship by EO; he may issue such an order because of this firmly held belief. However, "the separation of powers does not depend on the views of individual Presidents…" It depends on what the federal courts ultimately say about a particular presidential act, and whether it exceeds his authority. That is the constitutionally designed safeguard against the historically uncertain power of the executive order.